An important aspect of water system maintenance that is often overlooked is the wellhead. Service calls are frequently initiated by problems occurring at the top of the well. A recent service call involved wires that were damaged where they were routed over the top of the casing. Over a long period of time, pump vibration and startup torque had worn through the insulation on the wires (a common problem with poorly done installations). This is one reason why it is always a good idea to turn off the power supply before removing the well cap. A well cap that doesn’t fit tightly over the casing and conduit can also cause problems. In another recent service call the well was missing its cover so the homeowner simply set a bucket over it. Because there was space between the bucket and the top of the casing, mice were able to build a nest in the well. Eventually, the mice chewed through the wires enough to stop the pump from working. On another occasion we were called to find the source of what appeared to be pine needles in the water system’s cartridge filter. We found that ants had been nesting inside the well using pine needles to build their nest. 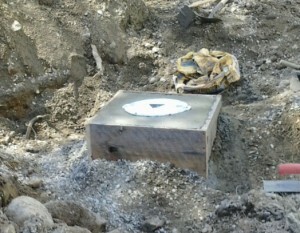 After a thorough cleaning of the well, a vermin proof cover was installed to ensure a proper seal at the wellhead. Homeowners often want to hide their well by planting shrubs around it or putting a decorative structure over it, but such an enclosed environment can attract insects and vermin. For this reason, keeping the area around the wellhead mowed and clear of vegetation and debris is always a good idea. Also check to make sure the conduit is the right size for the well cap and fits snug to keep pests out of the well. If you have followed these suggestions and you are still having problems with insect infiltration, a vermin proof well cap should be installed. These even come in a locking version if you are concerned about tampering. For safety purposes, we install locking vermin proof covers on all public water supply wells that we drill. Older wellheads may be buried several feet below ground, as this was standard procedure before the pitless adapter was invented. 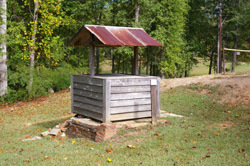 If your well is not visible you should have it located, unearthed and extended at least eight inches above grade to be in compliance with Maine state code. If you don’t do this when the weather is favorable, a well failure could force you to do it the middle of winter when the ground is frozen, at a considerably higher cost! In special cases, the wellhead has to be cut flush with or slightly below ground level. This should only be done when absolutely necessary and requires a special cover and enclosure called a road box. I recommend having a professional perform this kind of installation.